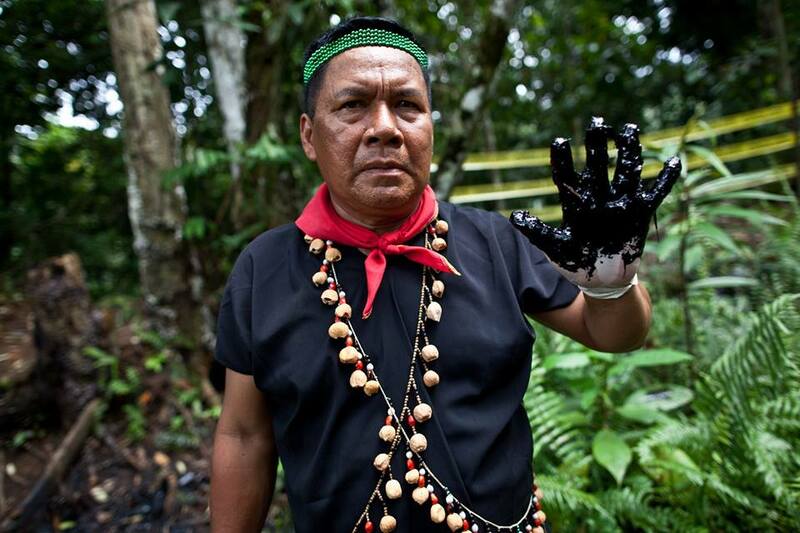 Co-founded by Sting, Trudie Styler, and Dr. Franca Sciuto in 1989, the organizations jointly known as Rainforest Foundation, began with a promise made by Sting to the Indigenous leader Raoni, of the Kayapó tribe, to help him and his people obtain legal rights to their traditional land. With these roots, Rainforest Foundation originally focused on the Amazon region of Brazil. This commitment to Chief Raoni was fulfilled in 1992, thanks to the generous contributions and support of people from all over the world. The physical demarcation of the Kayapó tribe’s land was undertaken by the Indigenous People themselves through the most modern technology. 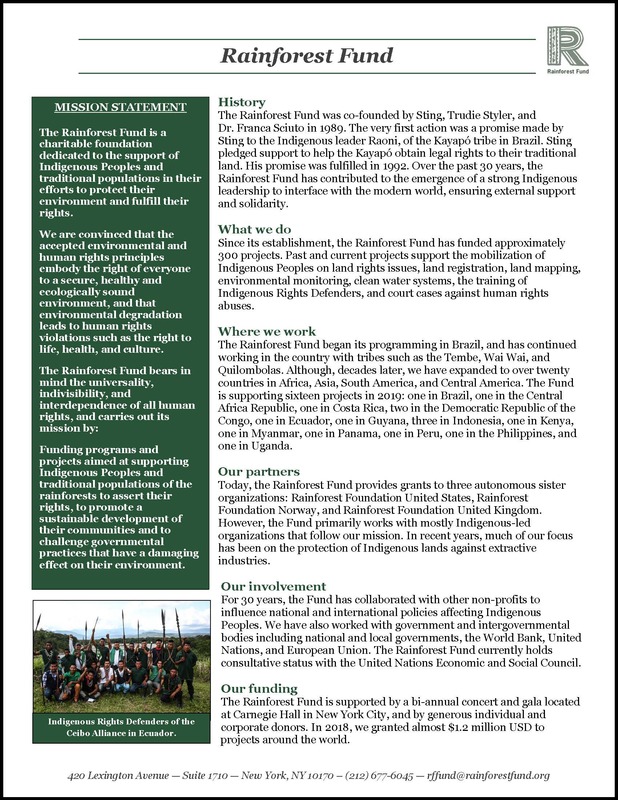 In fulfilling this promise, the Rainforest Foundation became Rainforest Fund and broadened involvement in all of the world’s rainforests, supporting Indigenous Peoples and traditional populations of the rainforest in their efforts to conserve their land and defend their rights. Since our beginning, programs have been developed throughout Brazil in multi-ethnic Indigenous territories. Beyond Brazil, we have since diversified our work by initiating new countries such as Belize, Kenya, Costa Rica, the Democratic Republic of the Congo, Bolivia, Myanmar, Ecuador, Mexico, Guyana, Honduras, Indonesia, Panama, the Philippines, Madagascar, Papua New Guinea, and Peru. Our approach has always been one of supporting on the ground projects initiated and carried out by local non-governmental organizations and Indigenous groups; dealing with land rights, community organization, forest protection and resource inventories, as well as legal support, human rights protection, campaigning, and advocacy. With the experience gained during years of work, Rainforest Fund as a whole developed even more professional and consistent programs; expanding in Africa through the specialization of Rainforest Foundation United Kingdom, in Asia through the expertise of Rainforest Foundation Norway, and the Americas where Rainforest Foundation United States broadened its involvement. Additionally, Rainforest Fund has been working with government and intergovernmental bodies including national and local governments, the World Bank, United Nations, and European Union. In our 30 years of work, Rainforest Fund has partnered with Indigenous communities on approximately 300 multi-year projects in over 20 countries, with a particular focus on human rights of Indigenous Peoples and their battles against the illegal loggers, settlers, mining, and oil interests.